State Name Meaning: From Hawaiki, meaning "place of the gods"
Originally called the Sandwich Islands by Captain James Cook in 1778 and traditional home of the Polynesians, the eight islands were consolidated into one kingdom 40 years later, established as the Republic of Hawaii in 1894, annexed by the US in 1898, and attained statehood on March 11, 1959. 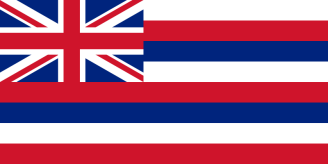 Prior to 1860, Hawaii birth records (as well as Hawaii death records ) were recorded by government authorities and some clergymen. Hawaii vital records went statewide with the registration of births in 1842 and deaths in 1859. Beginning in 1911, a person whose birth was not registered could apply for a delayed certificate of birth. For a fee, birth and death certificates can be obtained by mail from the State Department of Health. Only cashier's checks, certified checks, or money orders are acceptable forms of payment. Search Note: For a certified record, requester must provide the information needed to 1) establish his/her direct and tangible interest in the record and 2) locate the desired record. Record request forms are available from the webpage. Note: An applicant/requester must provide the information needed to 1) establish his/her direct and tangible interest in the record and 2) locate the desired record. Record request forms are available from the webpage.